Just like the name, Taman Mini Indonesia Indah is a miniature park of beautiful Indonesia. Located in the capital Jakarta, the park exhibits enthralling culture. From entire Indonesia’s 300 ethnic groups. Even more, Taman Mini Indonesia Indah also exhibits Indonesia’s natural beauty, coming from over 17,000 islands. At 1,5 km square area. It is a wonder how the park manages to squeeze the country’s rich diversity. In such a relatively small space. Taman Mini Indonesia Indah or TMII was founded in 1975 by Tien Soeharto. The first lady of Indonesia’s second president. There’s a large artificial lake in the middle of the park called Indonesia Miniature Lake. The lake has a collection of artificial islands designed to replicate Indonesian archipelago. Surrounding the lake. Traditional houses from 33 provinces of Indonesia were built on a real-life scale. Apart from the traditional houses, there are over 50 attractions to explore. Taman Mini has 19 museums, 7 nature parks, 3 cultural parks, 4 recreational parks, and other attractions. One of the most striking structures built here is Keong Mas IMAX theater. The stack shell architecture might look like it tries to imitate Sidney Opera House. But the design, in fact, resembles the golden snail ‘Keong mas’ from a famous Indonesian folklore. The best way to get around the vast Taman Mini Indonesia Park area is by bike. Which available for rent at Rp15,000/hour. First, go to the nearby Anjungan which is the closest one from the park’s entrance. Anjungan is what the traditional houses called. At Anjungan, prepare for a culture trip from Aceh to Papua. At Jogjakarta's Joglo house, try to play with the traditional instrument Gamelan. Walk through a beautiful Balinese gate "Candi Bentar" when visiting Bali’s Anjungan. When passing in front of West Sumatra’s Anjungan, it’s hard to miss the sight of colorful Gadang traditional house. Here visitors can learn about the only matriarch society in Indonesia, the Minang tribe. Continue to go on the bike, because there are still 30 other traditional houses to explore. Among the 19 museums at TMII, some are definitely not to miss. Asmat Museum will bring visitors away to Papua, the westernmost province of Indonesia popular for its Raja Ampat diving spot. But away from the ocean, Asmat tribe lives deep in Papuan jungle. Get to know about their customs and traditions in this museum. Try to make some beats with a war drum instrument called Tifa. And learn how to make Asmat’s staple food, the sagoo. Museum of Indonesian Fauna stands out with its giant Komodo architecture. It’s a museum, not a zoo. So expect to meet a lot of preserved animals from birds, butterflies, mammals, marine biota, and reptiles. But go outside to the backyard and be delighted as there are some real Komodo dragons living here. There are other living reptiles too, such as crocodiles and tortoises. Gardens at TMII is where one can take a quiet break with greens and nature. Park the bike and instead, go for a walk at The Bird Park. Swans and koi fishes swim at a small artificial river, while pelicans walk casually among people. Play several minutes with friendly pigeons. Before heading to Jasmine and Cactus Garden nearby. Learn Indonesian aquatic fauna at The Freshwater Aquarium Park. At Aquarium Park, be ready to observe about 126 species of Indonesian freshwater fishes here. Arowana (Scleropages formosus). A type of fish mainly found in Borneo rivers is on display. Along with its local sibling shark saws (Pristis microdon), and Tapah (wallago leerii). The collection also extends to fishes from other tropical countries. Enjoy the sight of the giant Arapaima, a giant freshwater fish originated from South America. After all the educational visit to museums, parks, and traditional houses, it's time to have some fun. Experience again the nostalgic childhood at Istana Anak. The Disneyland of TMII. Ride the rabbit train or get on to the Ferris wheel. 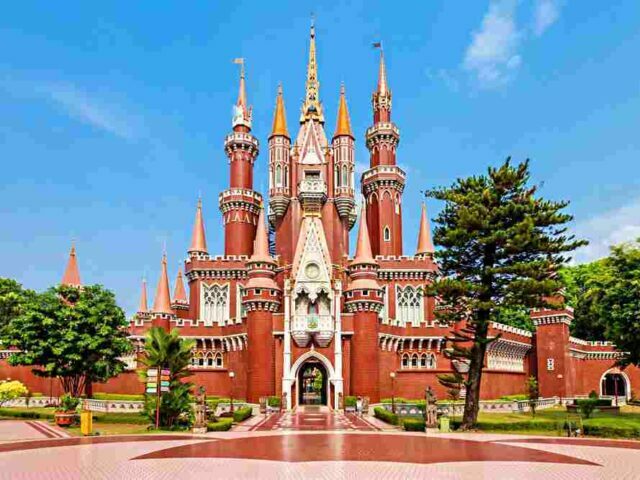 Inside Istana Anak’s Disney-esque castle. Mannequins clothed with Indonesia’s traditional costumes will remind visitors of a large dollhouse. Only more exotic. It’s easy to spot the golden snail building since it glitters under the sun. Go to Theater IMAX Keong Mas to watch Indonesian classics folktale. Take a ride with Gondola, where riders can have a nice view of the Indonesia Archipelago Lake from above. Lastly, strip off Jakarta's heat from the body by swimming at Snowbay Waterpark. Taman Mini is open early at 7 AM and closed late at 10 PM. The park is open every day. See: Things To Do In Jakarta, National Museum Jakarta. Entrance ticket is Rp 20,000 for everyone both local or foreign visitors. But visitors will need to pay additional costs for museums and parks separately. Meanwhile, the price varies, but on average, tickets cost Rp 10,000/museum. Recreational parks have more expensive ticket prices, from 40,000 for IMAX theater to Rp 140,000 for the waterpark. See: Things To Do In Jakarta, A Tour To The Biggest Mosque in SE Asia, Istiqlal Mosque. The castle is an all aged free zone. However, some of the rides are suitable only for children's. See: Street Food & Discover The Trace of Deutch Building in Jakarta Old Town. Likewise, not only the park is huge TMII also has the Snowbay waterpark. Bring swimming cloth, try all the rides and get wet in the waterpark. Snowbay waterpark is open every day including in National Holiday. And opens from 09:00 am to 06:00 pm. See: Jakarta Cathedral & Museum, A Century & Neo-Gothic Roman Catholic Church. TMII is equipped well with facilities. Large parking lots accommodate dozens of cars and buses. There are hotels inside the complex for visitors looking for a place to stay. Also, restaurants, gift shops, and even a bookstore are also available within the area. Toilets are available at almost every parks and museum. From Soekarno Hatta International Airport, visitors can go to Taman Mini Indonesia Indah by rental cars or taxi. While the journey takes 1 hour. Certainly, it is not including time waste being trap in Jakarta's horrendous traffic. Using taxi straight from the airport is also expensive. Therefore, choose public transport instead. Use a Damri bus with the route from Soekarno Hatta Airport to Tamini Square. Visitors can find Damri busses near the airport’s Terminal 3. From Tamini Square, make transit and hop on to a bus heading for Taman Mini entrance. For a faster option, visitors can use a taxi service from Tamini Square to the destination.